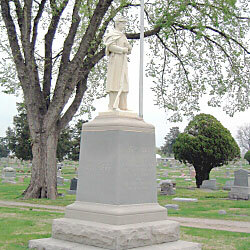 Description: Granite monument with a full-size private soldier at parade rest on the top. The inscription on the monument reads: "1861 - 1865 ~ In Memory Of Our Honored Dead ~ Erected 1922 By ~ V.O.Cartlidge Circle No. 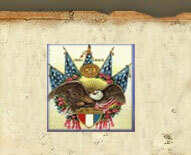 6 ~ Ladies of the Grand Army ~ Of The Republic ~ And ~ Abe Lincoln Camp No. 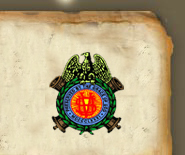 83 ~ Sons Of Veterans". The side of the monument is inscribed "1861 - 1865". 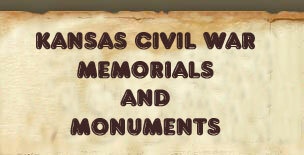 Description: Granite monument - thirty-two feet high, with a full-size private soldier at parade rest on the top. 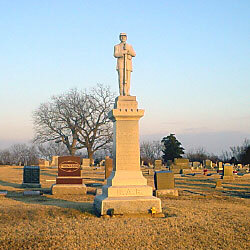 The inscription on the monument reads: "In Memory ~ Of The ~ Soldiers And Sailors ~ Of The War Of ~ 1861-1865 ~ Erected May 30, 1907 ~ Under The Auspices Of ~ Erie Post No 311 ~ Department Of Kansas".